Happy Friday! I can't believe it's Friday already. Since I came back from Mongolia and China, I've had a hard time knowing which day of the week we were, or what time it was. I've been floating around in a semi-conscious state, but I think I finally got rid of jet-lag- phew! Meaning I'm ready to create new content- expect a DIY project next week! Speaking of DIYs, if you have the time and desire to try your hand at a project, above are my 4 favorite tutorials of the week (links below). Hope you enjoy them as much as I do, and hope you have a fabulous weekend ahead of you. I love the scallop hem! ♥ Totally updates an old piece. I love love ,love your blog, its lovely ! Love the scalloped hem on that skirt! What a cute idea. you have such a way with putting beautiful things together! 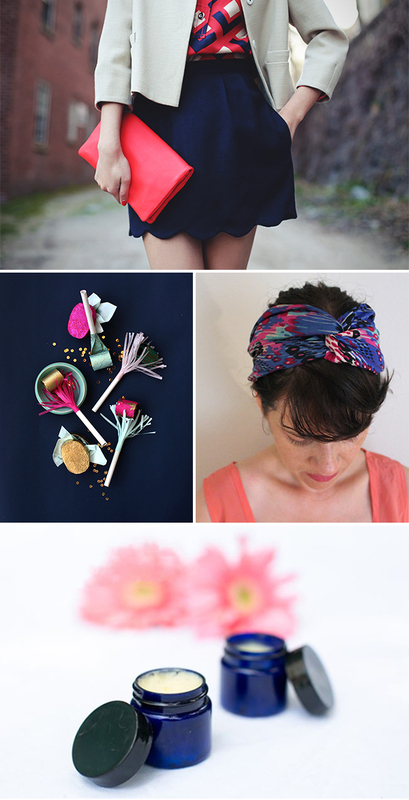 i especially love the scalloped hem and the headband. i hope to try them sometime!